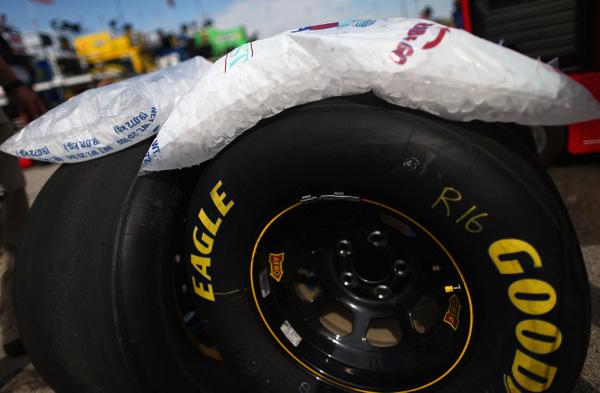 Uh, about the NASCAR Ice Capades in Kansas City last weekend: what the heck went wrong, and who's going to fix it? 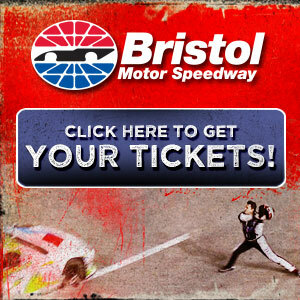 This sport's got another Sprint Cup date at that track in April. Goodyear's Stu Grant takes a deep breath and dives right into the controversy. It's late Friday afternoon at Charlotte Motor Speedway, and things are happening pretty darned fast in the world of stock car racing. Not all for the pretty, either. Up here in the heart of Goodyear's rolling technical center, Grant, the boss of bosses when it comes to racing tires, listens to the questions, ponders, and considers. "It's complicated....to try to figure out exactly what happened." The scene -- Kansas Speedway, repaved last year, with that super-smooth, virtually water-proof asphalt that has been used at most NASCAR track repaves for six or seven years now. A polymer-infused asphalt that keeps rain water out, and thus resists winter cracking and heaving. A super-smooth surface that at 80 mph might be a driver's dream....or at 180 mph, if the tires could get a good grip. Unfortunately this polymer-asphalt not only doesn't wear down, like traditional aggregate asphalt. Even some seven years after Darlington Raceway's repave, the surface has barely aged. And that creates problems for Goodyear engineers. 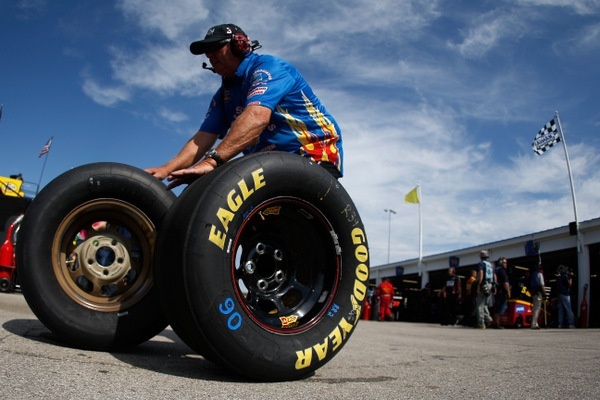 This past weekend was Goodyear's third race tire setup. The spring 400 setup wasn't great, drivers said. So Goodyear tested in mid-July and came up with something that the four drivers at that test -- Kurt and Kyle Busch, Greg Biffle and Ryan Newman -- liked. But when the Cup tour arrived at the Kansas City track last week, it was night-and-day different. Now Grant and his men are trying to figure out just what happened. After the spring race Grant and drivers and NASCAR officials all discussed that event. "We were asked 'Can you guys do something to improve the setup, because it's so much on the edge, so difficult, that we don't really feel comfortable.'..." Grant said. 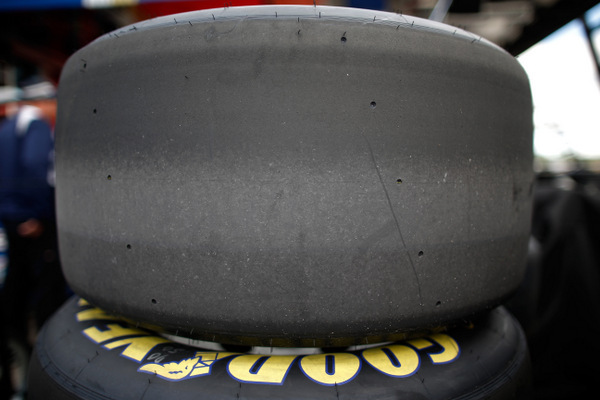 "There was not really a lot of tire wear (drivers and Goodyear both like tires that wear and slow down over a fuel run). "We said we'd try. We did the test. "When we went 'soft' all the way around, we'd go so fast we'd tear up the right-side tires. So that didn't work. "What we did find that worked was using a softer left-side. "Using the softer left-sides and this multi-zone (hybrid) tire on the right, drivers were six-tenths of a second quicker than the control tire. And it felt a lot better. "We tested at night in July, 4 p.m. till midnight, in conditions comparable to what we'd see race weekend." It was 85 degrees at night for the test; and last Friday's daytime temps ranged up to 93 degrees, close enough. "These stock cars historically like left-side grip, so everything made sense," Grant went on. But during race week drivers said the tire combination felt entirely different than it did during the test. Biffle even said it didn't feel like the same setup. However Grant says Goodyear didn't change the setup, that teams raced just what drivers felt had been the best setup at that test. "So we've got to figure out why we didn't get the same results in the race that we did at the test," Grant said. "The setup didn't seem to provide the grip we thought it would. "We're busy looking at the data. Our engineers are talking to the drivers, like you are, to try to understand what happened and why we didn't get the grip we expected." The new hybrid right-side Kansas tire was mostly the same as the spring Kansas right-side, with the inner three inches of the 12-inch tread a harder compound, to guard against heat. The new left-side was softer than the spring left-sides, which should have provided more grip. "We've got to get to the bottom of that and figure that out," Grant said. "And we've got to go back there and test before we race Kansas again (next May)." However it would have made a lot more sense for Goodyear and NASCAR to have retested at Kansas the day after the race, on a track rubbered in, with good comparable lap times to judge by. Instead, NASCAR teams headed to Martinsville Speedway to test for the upcoming Martinsville 500. "You're right, there is some benefit to that," Grant says of a quick post-race test at Kansas. "But you want to get all the data you can get (first), and have all the discussions with the teams. That's what we've been doing, trying to figure out what happened." "Jeff Gordon probably liked it too." However maybe there is a deeper issue here -- the super-smooth asphalt. Should track owners -- in this case, the France family -- be more proactive in this, rather than just telling Goodyear to bring some tires? "The asphalt, at all these tracks, is so tight and so smooth that it just doesn't create any wear," Grant says. "I've said it over and over -- for us to make a tire that lasts on a surface like that, it has to be hard and it has to be thin (thinner than the heavy-gauge rubber used at, say, a high-wear track like Atlanta). "The tire generates a lot of heat, and when a tire wears it sheds heat. "But at tracks like Phoenix and Kansas, the asphalt is so smooth it doesn't wear the tire. So we've had to go quite hard with a tire so that it doesn't blister or fail." Certainly track owners, after spending $10 million or so on a repave, don't want to spend any more money on another repave. However track owners also have a vested interest in having a good, competitive race, to keep fans coming back. 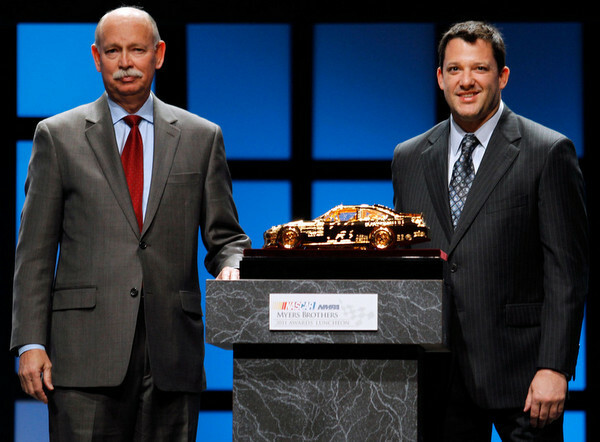 "We have had a lot of discussions with NASCAR, and showed them the surface analysis we've done -- Atlanta, versus Kansas -- to show visually the difference. "But we've got to deal with the surface we have to deal with, and we've got to start building tires for next season. We'll start building Daytona tires in a couple of weeks. "We'll work to improve what we have at Kansas and at Phoenix. "It remains to be seen, remember, what happens to these surfaces over time." 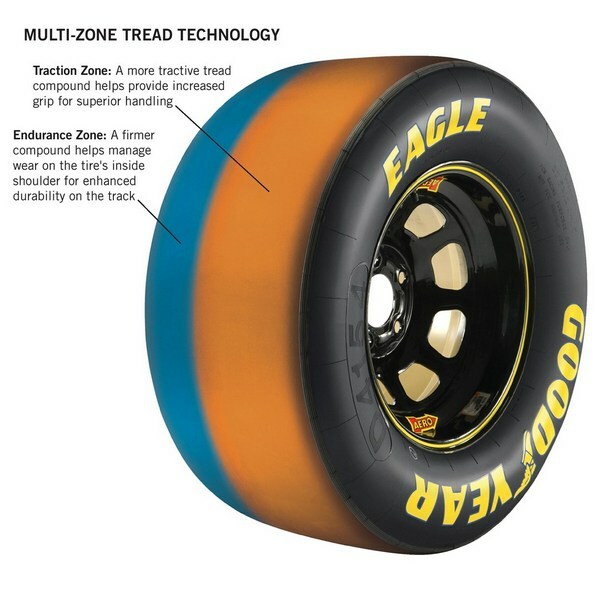 Tracks typically wear over time and become more abrasive, which teams and Goodyear both like. Unfortunately it looks like this new polymer asphalt doesn't wear much. Darlington, for example: Repaved in 2006, and today "it's not changing a whole lot," Grant says with a rueful laugh. So why can't track owner just lay another new course of asphalt on top of the current asphalt, a more coarse surface? This country doesn't have a shortage of contractors who can build roads. There should be expertise somewhere in how to modify the track surface. "NASCAR is involved in that," Grant says. "They've got an understanding of that. What's going to happen in the future, if anything, I don't know. You'll have to ask them, if they've got any plans to change the specs. "We're just dealing with the surface we've got." Submitted by Clem Zahrobsky on Fri 10/11/2013 - 18:48. Just diamond mill the surface like they did at Indy a few year ago; that certainly produced tire wear. Submitted by regina on Sat 10/12/2013 - 15:01. Interesting that in the 2014 schedule, Kansas now gets the Mother's day date that Darlington was moved to and Darlington now winds up screwed again by getting the date in April that is Tax Weekend! Whoopee, the race at Kansas was SOOOO GREAT that they get a different date. As if that is going to change things. Can you tell I'm annoyed about the change in date? Plus now Martinsville's spring date is March 30! Does NASCAR even care that it can be really nasty weather in March up in the mountains of VA? I really enjoy Martinsville but sitting through a cold damp race is not a lot of fun. I really think the people who do the schedule are total idiots. Along with the Goodyear engineers for tires and whoever does the engineering for NASCAR since they can't figure out the aero problem that has been causing a major issue with the racing ever since the COT was developed. Wonder why people don't show up at the track? Bad weather & boring races - 2 major problems.